The length of the blade is the equivalent of 9 double-decker London buses. The blade will now undergo extensive testing. The 80 m blade is the longest Vestas has ever produced. Test and verification of the blade is a critical stage of the development of the V164-8.0 MW. Moving as much of the verification process as possible into our state of the art test centre ensures the blade, the bearing and other components perform to the high standards our customers expect. 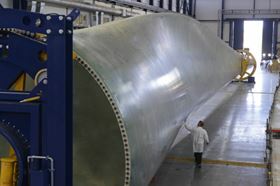 Vestas reports that the blade is based on the structural shell design, a proven concept in which the loads of the blade are carried in the shell, rather than using a spar at the centre of the blade. In order to validate the strength and reliability of the blade Vestas says it will be tested to its limits for 6 months, reproducing the challenging wind conditions of the North Sea over a simulated 25 year lifetime. The V164-8.0 MW prototype will be installed in the first quarter of 2014 at the Danish national testing centre in Østerild.